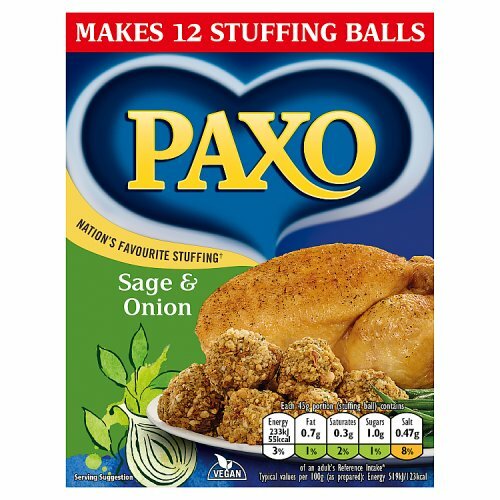 Paxo really know how to make stuffing, having been in the business for over 100 years. Paxo Sage and Onion Stuffing Mix is a classic blend that will really add something special to your roast dinners. 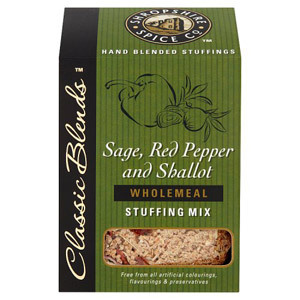 This stuffing mix is really easy to prepare - ideal when you are juggling the many tasks involved in cooking a roast. Simply add hot water to the powder and stir, before either rolling the mix into balls or packing it into a baking tray. Perfect for all roast dinners, Paxo Sage and Onion Stuffing Mix is the original and the best. Serves 8-10 people. Most popular with customers in France, United States of America (USA), Italy, Germany, Spain, Canada, Greece, Netherlands and Sweden, but you can buy Paxo Sage and Onion Stuffing Mix for delivery worldwide. One of our Paxo branded products. Contains Barley, May Contain Milk, Contains Wheat. Wheat Flour (with added Calcium, Iron, Niacin, Thiamin), Dried Onion (15%), Vegetable Oils (Palm Sunflower), Salt, Dried Sage (1.5%), Dried Parsley, Raising Agents (Ammonium Carbonate, Sodium Hydrogen Carbonate), Barley Malt Extract. Free From Artificial Colours, Free From Artificial Preservatives. Paxo stuffing is an absolute must at Christmas! It's the best stuffing on the market by far and so easy to make with our family recipe which includes sausage meat and a finely chopped onion.Makes the American stuffing look second rate! Now i'm trying to introduce it to my American friends and family for them to use at Thanksgiving and Christmas! The perfect addition to any roast dinner, this sage and onion stuffing has a classic flavour and is quick and easy to prepare. You can even roll it into lovely little stuffing balls that go crispy on the outside. These are even better when dipped into a rich gravy or even cranberry sauce, delicious! A wonderful brand and essential for any roast chicken dinner. Paxo has always made the best stuffing in my opinion and I will be ordering more in the near future. I live in Thailand ifwhen i want real British food real taste of home cooking . the best place to order is from here .Paxo's Sage Onion staffing is the key . afterall it work out cheaper to order direct from British Corner Shop plus there are many others things to buy too. 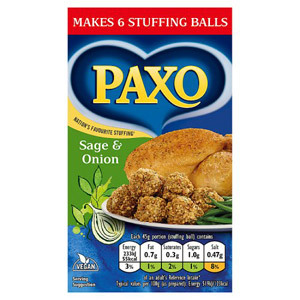 I simply love paxo stuffing, and I find the sage and onion flavour to be the most versatile. If I'm short on time, I simply make it as directed, but with more time I like to add my own twists at Christmas I like to add dried cranberries and sausage meat to the mix, absolutely delicious! My British wife introduced me to this and I have to say I'm hooked. She had tried making her own which was great, but Paxo is so much easier and I have to say tastier sorry love! It's a must now with our English Christmas lunch, it is now asked for by my family, so worked its way into the Swedish Christmas. You wont be disappointed! 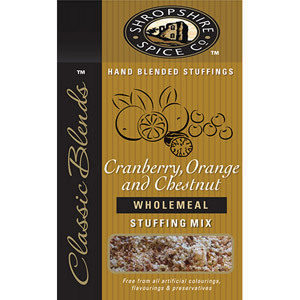 We ordered 2 packs of this stuffing to fill our 7kg turkey this year and had enough left to make more than a dozen mouthful-sized balls which we cooked with the roast potatoes. The sage and onion flavour comes through nicely, and it really completes a roast bird. Simply the best. Flavor and texture has no rivals. Would not be a Christmas dinner with out it. Now I have found a supplier here that delivers to the Netherlands we will never be without it again. This product was introduced to me by my British Mother-in-Law! Prior to using this product I was using bread crumbs and fiddling with the herbs and seasonings but PAXO takes care of all that for me!!! I live in Canada and even though we have strong British roots a lot of the products I fell in love with in England are very hard to find...but not anymore thanks to the British Corner Shop! It simply wouldn't be a family celebration without the Paxo! I have been eating Paxo Sage and Onion Stuffing ever since I was a child. This stuffing always accompanies a Christmas dinner - it just wouldn't be the same without it. This is very quick and easy to prepare and cook. The sage and onion has a nice balance that is strong but not overpowering. 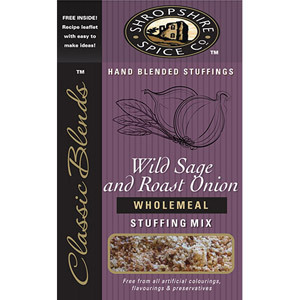 This stuffing is an absolute must for Christmas dinner as turkey would not be the same without it. Over the years I have experimented with Paxo sage and onion stuffing and one of my favourite inventions is to add it to a mixture of ground pork and turkey (raw) and an egg. Press into a loaf pan and bake. Serve hot or cold, quite lovely. A lot of people boast that they make their own stuffing for the Christmas bird. I am not one of them! Why go to all that work when Paxo have done it for you. Easy to make - just add water and microwave or bake in the oven. Good, tangy flavours with a bit of crunch. Delicious. Paxo Sage and Onion stuffing is an essential ingredient for a perfect Christmas. They are so easy to make as balls and will help you create the perfect stuffing for your bird on Christmas. Stuffing is something that should not be left out and that is so difficult to recreate. Simply the best basic stuffing mix you can get. And probably the one thing I miss the most. Excellent value for money and it keeps well. My Italian family have also got to know and love Paxo over the years and no roast in my house is ever without it. Cannot be without this, especially over the Christmas period. I just love the flavour and texture of Paxo Sage and Onion Stuffing mix. I usually make up the mix as directed on the packet but I let it cool and add half a kg of finely minced fatty pork and some eggs, before stuffing my Christmas turkey. I don't like messing about with chestnuts, cranberry or other weird flavoured stuffings. This, to me, is the best! Also delicious made into balls and eaten with gravy, as long as it has the minced pork mixed into it! Being vegetarian it might seem odd reviewing something that is normally paired with meat. However Paxo Sage and Onion stuffing is vegetarian and can make a nice main dish with roasted vegetables, mash and vegetarian gravy. I add some chopped nuts to the mix before roasting and it makes a nice main. Paxo is something I always buy when I can. Paxo has become a household name for good reason. Many households across the UK use it to stuff their Christmas Turkey but it's really much more yummy than restricting it to once a year. Rolling balls of stuffing to go with many roast dinners adds a little bit of something special. It's also worthwhile making more than the immediate need, since the balls can be sliced and used with chicken or turkey breast to make sandwiches which are a lot more scrumptious than without. This is always kept in the cupboard so I can feel seasonal all the year round. This is a good product. It is easy to make and makes a decent quantity of stuffing. I had enough to stuff a 2 kilo bird over Christmas with one pack and it was enough to feed six people. The price is reasonable. There are plenty of varieties to choose from so I will be ordering more. Paxo sage and onion stuffing... just the words make you feel peckish. Picture a big roast chicken, all golden and juicy and there, nestled by it side on the roasting tin are little balls of delight. The whole house smells wonderful. Thank you BCS for making my Sunday perfect again. Paxo Sage and Onion Stuffing mix is a must for a proper Sunday roast, particularly with chicken. Easy to use and very full of flavour, I usually make up the mix as instructed on the packet, then I add half a pound of good quality sausage meat and one egg. I still use it to accompany the roast, though I bake it in a separate tin. It's so delicious that usually my lot just ask for the stuffing and leave the main roast behind! A good bye every time. A proper British roast dinner simply would not be the same without Paxo sage and onion stuffing. All you have to do is mix with hot water and pop in the oven. I like to roll them into balls, but you can also just press into a dish and portion it up once cooked. A cupboard essential in my house. Wow! What a find this was, after having been deprived of Paxo Sage and Onion stuffing mix since moving to France five years ago. The perfect accompaniment to a proper British-style roast dinner, this stuffing mix is one of the best on the market, and very quick and easy to mix up and make as well. An all-round great buy! I don't think that you can possibly cook a Pork Roast Dinner without Paxo's Sage and Onion Stuffing. I've tried on more than one occasion to make my own by carefully following various recipies, but I have never succeeded. No stuffing I have made myself has ever had the taste of Paxo, plus they have always taken a long time to make, whereas Paxo is effortless and always tastes delicious. Having lived in France for the last four years, we had missed Paxo's Sage and Onion stuffing mix, but now thanks to BCS we can get hold of it now have that taste of the past. I have tried many times to make my own stuffing, but it is never the same nor as good. 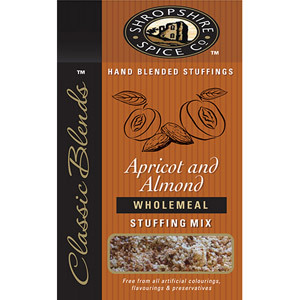 We were pleased to find Paxo stuffing available to us at a reasonable price, thank you. Would you like to write a review for Paxo Sage and Onion Stuffing Mix?